If I asked you to write a list of everything you wanted and needed to do it would be pretty long, right? If you popped that list in your planner or bullet journal each week it would be pretty overwhelming I’m sure. 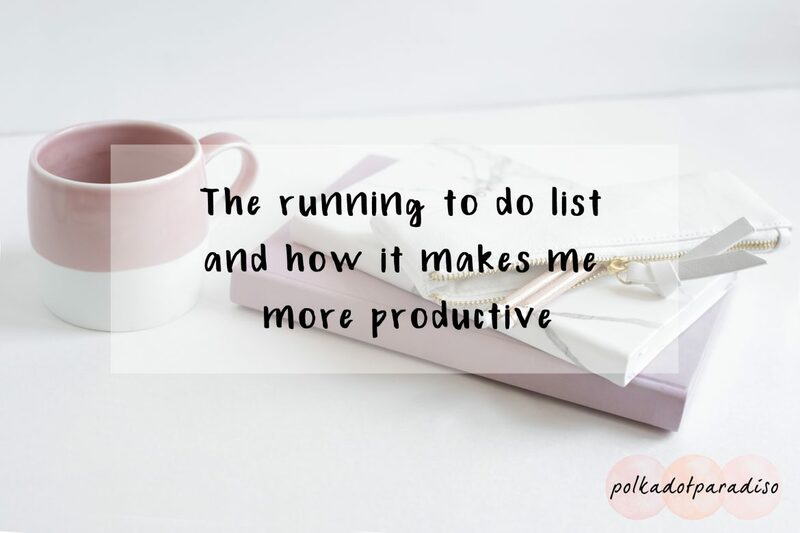 I don’t know where I came across the concept of a running to do list but it’s something I’ve been using on and off for a few years now. It’s a to do list which essentially never ends. It moves with me from month to month and will grow and get shorter depending on what’s going on in my life at that moment in time. Then, each week when I’m doing my weekly planning I review this list. Anything I either need to do that week (or would like to) gets transferred into the weekly plan. As the month goes on, I may add to that list with anything else that pops into my head, or anything I know might be coming up in the next month. This allows me to have an awareness of everything going on without clogging up my weekly view. Why is the list in the monthly view? I’ve had a separate section in my planner for this before and it just doesn’t work for me. I review my monthly spread each week when planning out the week and having somewhere else to look just meant it got missed a lot. As some of the to do’s also related to dates in the month (birthdays in particular) it made sense to have it all in one place. I do still have separate areas in my planner for things like sticker ideas and blog post ideas. Only more firm things such as ‘create Spring weekly kit’ would make their way into the running to do list. I can’t rave about brain dumps enough. You might not like the phrasing of it, but just somewhere to get everything down while it’s still in your brain is fantastic for ensuring that nothing gets missed. This is basically a brain dump for things I need to do. If something pops into my head it’ll either go into my every day carry planner, and then get transferred onto my main planner, or it’ll go straight in here. The fact that it gets reviewed every week with my weekly planning means everything I either want or need to do gets considered and planned in. It’s particularly useful for projects I have in mind. If I’ve seen a great embroidery design that I want to do I can pop it on my list. As it’s got a mix of things that absolutely must be done and things that I’d like to do, it means there’s no pressure to tick everything off each month. In fact that’s the opposite of what it’s intended for. If I am a loose end one day or weekend, I can just flick to this list and find something that I want to do. I definitely go through phases with this. Some months, everything goes in this list. Others, it’s just the essentials that I know I might forget otherwise. Either way, this has been around in my planner in some form for the past couple of years now. Do you use something similar in your planner? I’d love to read in the comments below!